This post was shared at the Simple Saturdays Blog Hop! I've always associated sauer kraut with my Grandma Marshall, and with New Year's Day. Grandma Marshall made kraut in a large round crock, with cabbage from her garden. I remember watching her chop and pack the cabbage, and seeing the crock sitting in the kitchen. How much of it she ate on a daily or weekly basis, I can't say, but a large portion of kraut would be served on New Year's, every year, along with sausage balls that Grandma seasoned to perfection with salt, pepper and fennel seed. We've carried the tradition on in the years since she died. I put my quart jar of homemade kraut next to the big roasting pan this New Year's Eve. Keep a quart jar of kraut in your fridge at all times. Eat some kraut every chance you get. It's delicious, goes with so many things, and will make your belly so happy! It's very easy to make sauerkraut in a quart jar. Making and storing it in a quart canning jar is the perfect way to keep this miraculous, tasty food on hand. And trust me--homemade kraut tastes nothing like store-bought (though I love store-bought, too). Homemade is so good, you'll want to eat it every chance you get. *The method I've described below was inspired by the book Fresh & Fermented (affiliate link), a hot-off-the-presses book I highly recommend for insanely delicious, but down-to-earth ferment recipes. I checked it out from the library, and then renewed it until I ran out of renewals. This one needs to be owned and put on my shelf for continual reference. Cover jar, put it away, and wait! Place kraut in fridge when it's ready to your liking! 1. Make the brine, set aside. 3. Slice cabbage in thin strips, as thin as you can make them without hurting yourself. (I use a knife. For thinner kraut shreds, you could use a mandolin (affiliate link). 4. Put cabbage in the largest bowl you own, sprinkle it with the salt, and let it sit for at least 20 minutes to allow the juices to start flowing. 5. Start working the cabbage shreds. Some people use a pounder. I use my hands. It's therapeutic...get really rough with that cabbage....squeeze it, punch it, pretend it's your boss. But be careful of brine flying into your eye...it's as fun as getting sea water in your eyes (not very). This can take from 5-15 minutes to get the cabbage beaten to its kraut-worthy state. but also for pressing the kraut into the jar. A pounder kind of like this one! My dear friend Eddie over at Homestead Chronicles makes beautiful wooden pounders by hand. CLICK HERE to see Eddie's pounder catalog. 6. Taste for salt. In my salt post, I talked about experienced fermenters knowing how to taste for salt before setting it aside to ferment. I am not to that point yet! In this recipe, the pre-made brine that you set aside is a good salt-taste indicator. 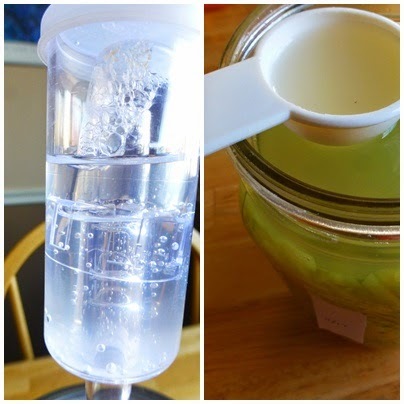 If the cabbage brine doesn't 'match' your pre-made brine, either add a bit more salt, or a bit more water. The pre-made brine is sort of like a set of training wheels, teaching you to taste for the perfect amount of salt. 7. Pack the cabbage into a quart jar. Press it, push it, force it. You'll want the brine an inch below the rim, and the cabbage an inch below the brine level. Pour in more pre-made brine if needed, then cover any leftover brine to store in the fridge in case you need more later. Once the cabbage is tightly packed with the proper head space, hold the cabbage down using a weight. Weights can vary with each person's preference: baggies filled with brine, large clean rocks, the core from the cabbage. I keep it super easy by using my weights from fermentools. *If all the cabbage simply won't fit, don't panic! Save the cabbage for another use. I used a 2-pound cabbage and had a couple handfuls left, which I saved and put in a soup later on. 8. Set jar aside and wait. Check the brine level each day; the cabbage will continue to release its water, and you may have to remove some brine to keep it an inch below the lid. Cabbage 2 inches below rim of jar. leaving an inch of head room at the top. Pour in extra brine if needed. a pantry, counter, or cabinet works well. 9. Start tasting after a week. Mine was ready in just under 5 weeks. The taste will go from salty and crunchy to mouth-wateringly tingly and scrumptious. Brine began to bubble into my airlock. No big deal! brine to keep the level one inch below the rim. 10. When kraut reaches perfection, store in fridge. If using airlock, remove it and use a lid (fermentools comes with a rubber stopper to put in place of the airlock so you don't have to change lids entirely...perfect!). The fermentation will be slowed, but not completely stopped; the flavor will subtly deepen. According to some sources, the kraut will keep in the fridge for 6 months to a year, but it's doubtful you'll have to worry about it lasting--in fact, you may want to get another jar going soon after the first is finished, so you don't run out. Keep kraut preserved properly; each time you dip in, re-cover the kraut with brine. If there isn't enough brine to cover, add more filtered water or pour in some of the reserved brine (kept covered in the fridge). These tools make quart-jar-kraut even EASIER! I gathered some ideas for eating kraut from some really incredible bloggers. My mouth was literally watering as I compiled their ideas! I added my own ideas to the list as well. Kraut can really be eaten every single day, even if just a tablespoon or two--you'll stay healthier and will be able to digest your food better. Natural and easy probiotics! Thank you for the detailed post! I never tasted kraut before but since I learnt it contains vitamin B I want to try my hands on it. This looks so good, does it smell? Like when your parents come in, are they like, uh...? I am always so worried about weird odors in the house. He he. That's awesome, I would think your whole house would smell like sour kraut! Tee hee! I'm going to have to try this soon! A few years ago, Mom and I made enough to fill my 4 gallon crock. We canned it, and I still have 4 quarts left. :) Slightly different than in a quart jar (which I've done, too), and I was "winging it" with salt, but still the same basic idea. I should note down some of those ideas and see if I can get our 4 quarts eaten. A four-gallon crock---now THAT'S a lot of kraut! Some of these simple ideas will definitely help you eat through it all, trust me. Thanks for stopping by, Marie! Now, WHY am I just now seeing this? This is fantastic! Thanks for all the great ideas and clear instructions. Great work, Andrea!